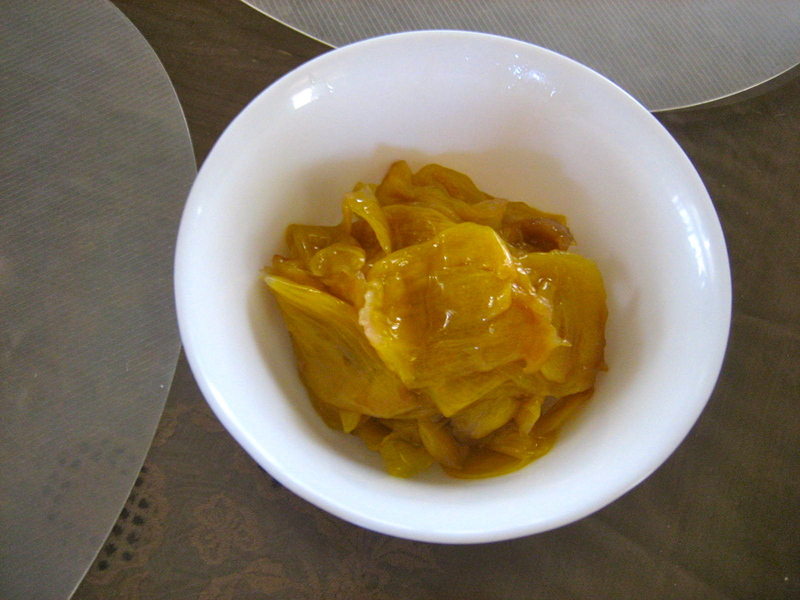 On our most recent trip to Tarlac, we ended up having one un-yummy jackfruit in our hands. The kind that isn’t as sweet as you want, or as old as you want. What we got was a young one, forced to ripen, with thin stringy meat with some hint of sweetness but no satisfaction whatsoever. It has been in our freezer for almost for two weeks when I decided we better improve on it, hence, the minatamis na langka. Create a sugar syrup by boiling the sugar and water over low heat. Don’t allow to brown too much (unless you really like the jackfruit caramelized). Once the syrup has become a goopy liquid, put in the fruit (any fruit will work the same way) and let it simmer for a good 10 minutes to ensure that all of the fruits are cooked slowly in the sugar and that their flavors develop. Cool. Set aside. what do you mean like prune’s quality? Like candied? 🙂 Maybe my post on candied ginger would help!